also, for those that are interested, there is a group on ravelry and a few videos showing this technique on youtube. 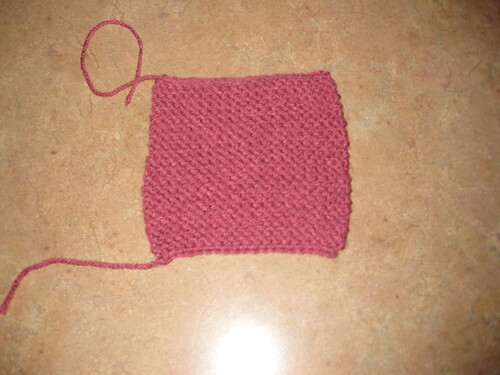 *Just wanted to add that I have now posted pics of a knooked cable swatch I did to my flickr, for anyone interested in looking. Very good.. keepup the good work.. Very nice work you will get the hang of it when you do it gets easier along the way. Great job I also knit and I love that you can do both for certain patterns. i think may have to give that a whirl. Wow, thanks for turning me on to this. Always wanted to try knitting, but figured it would be really hard, especially because I didn't know how to keep the yarn on needle without the hook at the end! May have to look into this. Keep up the good work. Looks good to me. I am going to look into this since I like the look of knitting but am not very good at it. wow very nice,never heard of that tho,I knit an crochet both,There are places like youtube.com,knittinghelp.com that shows u how to knit.Might give that a try. Could you also do this with 2 Afghan hooks? There have been many terms for this from cro-knit and on, without going on at length. I mention this, as there is tons of info on the net and from old books. "Knooking" is a word someone came up with more recently, and so people are having trouble finding info, but the technique is older and you can even find old supplies, book, and groups on the net and thru older sources, like crocheters and knitters from a generation or two ago (and much longer in other countries). Knooking is knitting with a crochet hook. It is really knitting, it is not cro-knit, or any of the other forms of tunisian crochet. In all honesty, this has been around for decades, and is having a resurgence. It has been called several different names, and the techniques are the same. Any innovations are that the Japanese have created some more sophisticated fabric manipulations (as they have in lace knitting and various other forms of needlework), but the technique is the same, just goes by varying names. This is comes from my 50 years of knitting and crocheting (and other forms of needlework) and following the industry. Tunisian crochet is another thing altogether (though the stitches are retained and worked right to left and then left to right on the return row, but different than knitting). Perhaps others have blended Tunisian in with the "knitting with a crochet hook" but that would be incorrect. This is a method of knitting for crocheters who have difficulty learning how to knit but ar used to handling a crochet hook. I have tried cro-hooking, and this is NOT the same thing. It does look interesting. But I don't think I'll try it. It really does look like knitting...can you do cables with this technique? I think some of the disparity is from the perspective of a knitter, vs a crocheter. 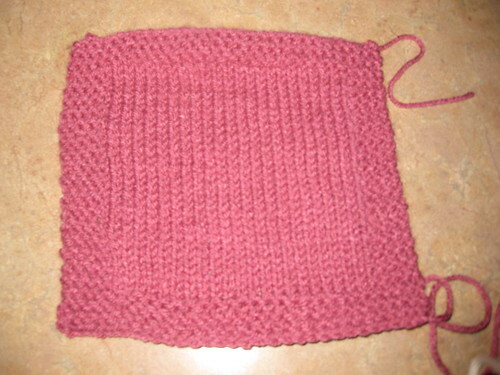 It seems that crocheters equate cro-knit with a double ended hook, but for 50 years or more, knitters who used a crochet hook to do regular knitting, called it cro-knit, amongst other terms. That has nothing to do with Tunisian or afghan stitch, which is different. Knooking is a word that was recently created (within the last few months) by someone who is popularizing it on Ravelry. The main point is, the technique isn't new. Those who do both kinds of needlework, and perhaps consider themselves knitting dominate, have for a long time done, and use different terms for, knitting with a crochet hook. Something old has become new again, but with the internet and influx of information, could assume it didn't exist before and current (or perhaps mis-use) of a term seems to want to dominate. Another example would be winter neck wraps currently be called a "cowl," but most of them are in fact smoke rings, snoods, gators, and not technically a cowl, which is in brief: a draped neckline. I guess here, someone with an education in this field and nearly 60 years of experience and lots of research since, may be including information that existed long before current awareness. I can only share what educated and well versed great grandmothers and historical articles called it. There seems to be much confusion about it, how to do it, and terms, tools, and techniques. It really isn't about being right or wrong, but about sharing something that may be insightful and of benefit to those who are searching information from all perspectives including things of historical value and wish to know a lot about many things. Would it be possible for you to list some sources for your information? I would be very interested to learn more. From my research into Knooking (the technique, not the name) I've only been able to trace it as far as originating in Japan within the last decade or so. Cro-Knit, as it is understood today (double ended hook) I believe was introduced by Mary Middleton in the 70's. However you seem to be implying that making knit fabric crochet hooks has been around for much longer. I do know there is a method called Portuguese Knitting that uses two hooked needles. Would this perhaps be the technique to which you refer? Knooking makes knitting fabric using a single hook. If you have resources on single hook knitting techniques I would love to know, as they may provide more valuable information and techniques. Ok, I'm not an expert at either, but crochetknit and knooking are not the same thing. Crochetknit does not keep all stitches "live" at all times. It seems to a close cousin to Tunisian, (though not exactly the same) in the aspect that stitches are live for a half a row, then 'cast off" on the return pass. Knooking creates true knit stitches, and uses 2 tools (although they are attached to each other) : the second needle holding the stitches from the previous row is the cord attached to the hook. You don't start with a chain (like crochetknit), you cast on just like knitting, and at the end of the piece (not each row) you cast off just like knitting. In between, all the stitches are always live on the hook or cord. I think it's great that there are so many ways to make yarny fabric. On Ravelry, in the Russian Knitting group, the host demonstrates in a video that, like in her language there is no separate word for knit and crochet, she can knit with 2 crochet hooks and crochet with knitting needles (awkward, but possible).